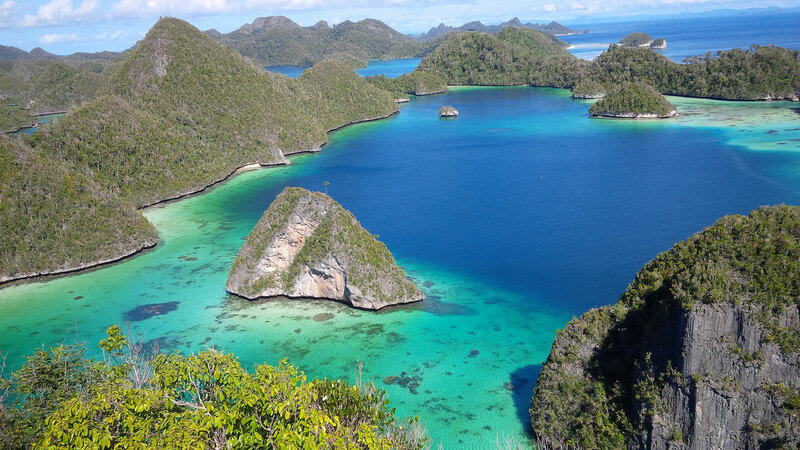 Raja Ampat is not one of the most frequently visited scuba diving areas, that might even contribute to the fact that it's a jewel in 'diving land'. It has the highest marine diversity on the planet. Beautiful sceneries and awesome underwater photography make some people even call it the closest place to heaven. To stand on the bow of your yacht, sailing towards the islands, gives you an unbelievable feeling of freedom. There is a great variety of environments; caves, canyons, seamoungs, diving, wrecks and much more. Cape Kri: if you want to be surrounded by fish, big fish, then this place is a must. Barracudas, Dogtooth Tuna, sharks; they're all here in numbers. It is a great place to spot wobbegongs (the curious carpet shark) and pygmy seahorses. Misol Island: this island is located in the southern part of the Raja Ampat and is home to an astonishing colourful reef scene; soft corals, walls and canyons in dressed in a colorful palette. The Jef Fam Group: located in the central region of Raja Ampat, it's quite proabable you'll visit it, either via a northern or southern cruise. It's a quite large area with some impressive cabbage corals, sheet corals and mushroom corals. You can also see giant clams, barracudas and manta rays. Manta Ridge: this is one of the best diving spots in Raja Ampat. Mantas are regulary seen.